유기농 화장품 전문브랜드 CHOBS 전제품 24종이 COSMOS-standard BDIH 인증을 획득하였습니다. 유럽의 여러 천연,유기농 화장품 인증 기관(에코서트, BDIH, ICEA, 코스메비오, 소일어쏘시에이션등)이 COSMOS-standard AISBL이라는 단체를 만들고 여러 인증 기준을 통합하여 하나의 인증 기준인 COSMOS-standard로 기존의 각각의 인증 기준보다 더욱 엄격해진 함량 기준 등에 따라 인증 심사를 진행하기로 협의하였고 그 기준에 따라 획득한 BDIH 인증입니다. 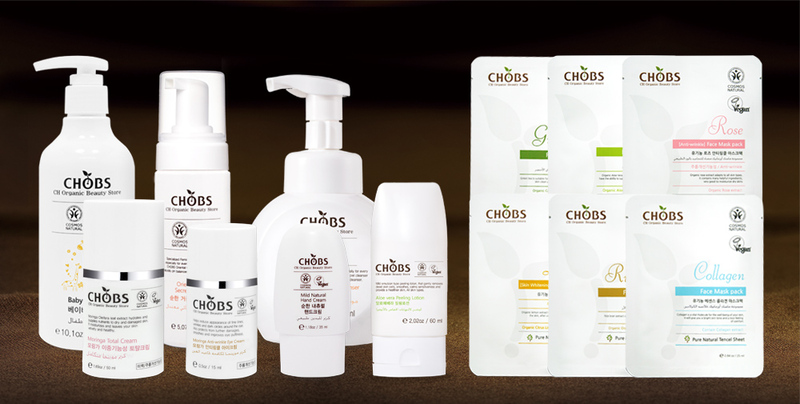 Organic cosmetics brand CHOBS 24 products have been certified by COSMOS-standard BDIH. Several European natural and organic cosmetics certification bodies (Ecocert, BDIH, ICEA, Cosmebio, soil accociation, etc.) created a group called the COSMOS-standard AISBL, By integrating certification standards. COSMOS-standard, which is one united certification standard, is even more strict than previous other standard. Click! Check the COSMOS-standard BDIH certified CHOBS. ▲ COSMOS-standard BDIH인증을 받은 유기농 화장품 전문 브랜드 CHOBS를 위의 사이트에서 확인하실 수 있습니다. 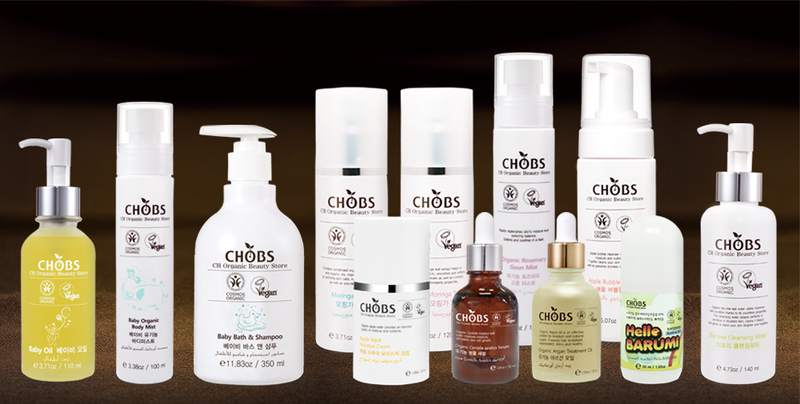 ▲ COSMOS-Stnadrad BDIH certified Organic cosmetics brand CHOBS can be checked out the site above. 제품에 사용된 농산물(물리적가공)의 95% 이상이 유기농이어야 하며 완제품의 20% 이상이 유기농 성분이어야 합니다. 예외적으로 세정 제품과 비유화 수성 제품 및 적어도 80%가 미네랄 또는 미네랄 유래원료인 제품의 10%가 유기농 원료여야 합니다. 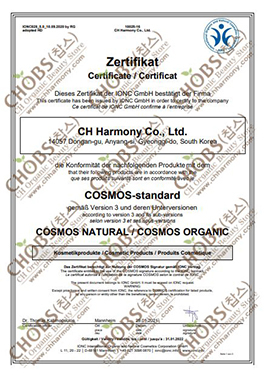 CHOBS 12 organic cosmetics have been certified with BDIH COSMOS ORGANIC. At least 95% of the physically processed agro-ingredients must be organic. For rinse-off products, non-emulsified aqueous products, and products with at least 80% minerals or ingredients of mineral origin, at least 10% of the total product must be organic. COSMOS NATURAL 인증은 ORGNAIC 인증 요건과 동일한 기준에서 주어지는 인증입니다. 단, 유기농인증 원료의 함량을 기준하여 제품에 사용된 농산물(물리적가공)의 95% 이상이 유기농이어야 하며 완제품의 20% 이상이 유기농 성분이어야 한다는 조건에 부합하지 않는 경우에 주어지며 유기농 원료의 함량을 표기할 의무는 없습니다. 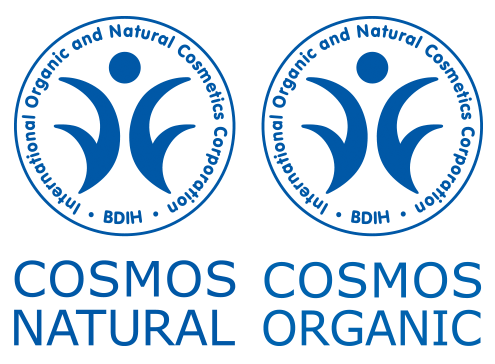 CHOBS 12 organic cosmetics have been certified with BDIH COSMOS NATURAL. There is no requirement to use a minimum level of organic ingredients. For products that are natural origin, the indication of the percentage natural origin is not obligatory.